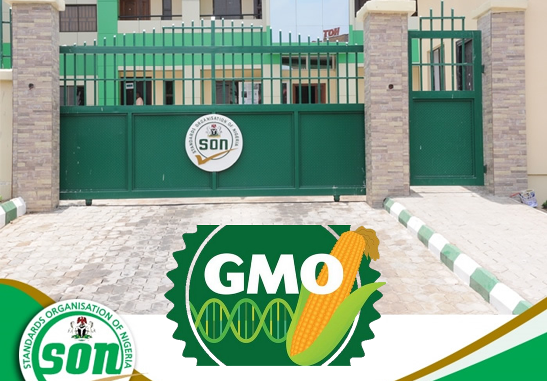 At a Workshop in Abuja, the National Biosafety Management Agency (NBMA) releases procedures for GMO products importation in Nigeria, and hints of MoU with SON and other agencies. The National Biosafety Management Agency (NBMA) has signed the fifth Memorandum of Understanding (MoU) with the Standard Organisation of Nigeria (SON) on proper regulation of the practice of modern biotechnology activities and its products in Nigeria. Dr. Rufus Ebegba, Director-General/Chief Executive Officer of NBMA dropped hint of this development in his remarks during the one day consultative workshop on processes and procedures for importation of Genetically Modified Crops/Products held December 4, 2017, at Denis Hotel in Wuse, Abuja. In his response, the Director-General of SON, Osita Aboloma, who was represented by the Director Legal Services, Umaru Kawu, expressed satisfaction that SON is partnering with NBMA to actualise its mandate. He also emphasised the need for government agencies in Nigeria to synergise to facilitate government goals. “This MoU is a good one and I am happy that NBMA has signed MoUs with other major government agencies that will contribute to the effectiveness of its mandate”, Kawu said. The MoU between NBMA and SON has added to the number of other agreements the NBMA has reached with government agencies in Nigeria in the bid to ensure that genetically modified products are safely deployed for the benefit of Nigerians. The other agencies NBMA had earlier signed MoU with include the National Agency for Food and Drug Administration and Control (NAFDAC) and the Nigeria Customs Service (NCS). More of such agreements appear to be on the way soon as Ebegba hinted at the forum. He said that his agency is pursuing prospects of entering into collaboration with different sister agencies for effective synergy in the regulation of GMOs. The workshop was organised after foiling an attempt by a foreign businessman to import large consignment of Genetically Modified maize from Argentina without obtaining Biosafety Permit in Nigeria. Ebegba explained that the MoU became necessary because of the need for government agencies to work together to increase surveillance on trans-border movement of Genetically Modified (GM) products. He added that the Mou will further help to enhance proper analysis of Genetically Modified Organisms (GMOs) to ascertain that it constitutes no risk to Nigerians or the Nigerian environment before they are commercialised. Ebegba further stated that the NBMA was established to ensure that the practice of Modern Biotechnology, leading to GMOs, is safe for both humans and the environment. Thus, “Risk assessment is a pillar of the agency and NBMA is interested in the gene of insert’’, he said. Ebegba used the opportunity of the Workshop to confirm that NBMAs analysis and tests from an independent laboratory on samples of the consignment discovered at the Apapa Port, Lagos a few months showed categorically that the imported were genetically modified. He also revealed that the consignment has been repatriated ‘’due to the failure of the importing company to obtain a seed Biosafety Permit from NBMA’’. He emphasised that there shall be no sacred cow in the implementation of these laws which he described as non-discriminatory and of international standard. He reassured all that government has what it takes to protect Nigerians and is not ready to compromise neither its citizens nor the environment. Ebegba stressed that due diligence is required in the importation of GMOs and appealed to seed companies for compliance with the regulatory provisions to ensure that things are done in accordance with the provisions of the Law. He therefore warned that every trans boundary movement has to fulfil the necessary obligations required, for approval within 90 days of application as contained in the Biosafety Act; noting that his Agency will not hesitate to exert its authority to either impound, destroy or prosecute such cases depending on the circumstance and indicated that enforcement is not limited to the ports. He maintained that NBMA shall not tolerate any illegality such as the marketing of seeds without approval, the alteration of labels to trick people or the obstruction of staff during control activities; insisting that the Agency does not require to be induced to discharge its duties, which is of national interest. Other speakers from NBMA include Scholastica Bello (Mrs); Head, Planning, Research and Statistics and Chinyere Nzeduru (Mrs); Director, Environmental Biosafety and Commercial Release. They collaborated the position of the Agency in the safety regulation of the GMOs in their respective presentations, and Mrs Bello added that under the purview of NBMA, is Africa’s best trained staff on effective biosafety management. Nzeduru in her contribution explained the Catagena Protocol which was used in the domestication of the NBMA Act is not punitive but an important reference document that gives guidelines for biosafety applications. It was clearly stated that GM seeds are natural and the use of GMO is not negotiable. During her presentation in the workshop, Dr. Rose Gidado, Country Representative Open Forum on Agricultural Biotechnology (OFAB) Nigeria, illustrated that GMOs are economically viable, scientifically verifiable and environmentally sustainable. She noted that every food item is a product of Biotechnology and no food is static, emphasizing that no technology is risk free. Dr. Gidado highlighted the importance of biosafety regulation on biotechnology applications in Nigeria most especially as a strategy to enhance Africa’s low level of inter-global trade. In his own words, Dr. Matthew Dore, Country Representative, Program for Biosafety Systems (PBS) remarked that despite what the detractors may want to believe, the world’s organized societies like the United Nations (UN) and the Food and agricultural organisation (FAO) have defined modern biotechnology as a basic tool needed to ensure global food security and nutrition. He sighted Vietnam, as one country that used this singular approach to defeat food insecurity and added that efforts should be made to ensure that safety elements are put in place. In his conclusion, Dr. Ebegba maintained that no mandate given to the Agency shall be kept aside in the provision of regulatory framework for safety measures. He preached the need for synergy rather than rancour between agencies and suggested that Nigeria should capitalize on its potentials, institutional and human capacity to sustain the progress made so far instead of allowing other nations to take advantage of our weakness. He implored Nigerians to trust the leadership of NBMA as government is not ready to compromise the health of its citizens and the environment. He reassured participants that ‘’When the lion rises, it will dominate Africa’’. In attendance were some representatives of Partnering Regulators, Seed Companies and Monsanto. Also, representatives of Developmental Partners (ABNE, USDA & USAID), CBN, MDAs, Security Agents, CSOs, FBOs and NGOs including Every Woman Hope Centre (EWHC).